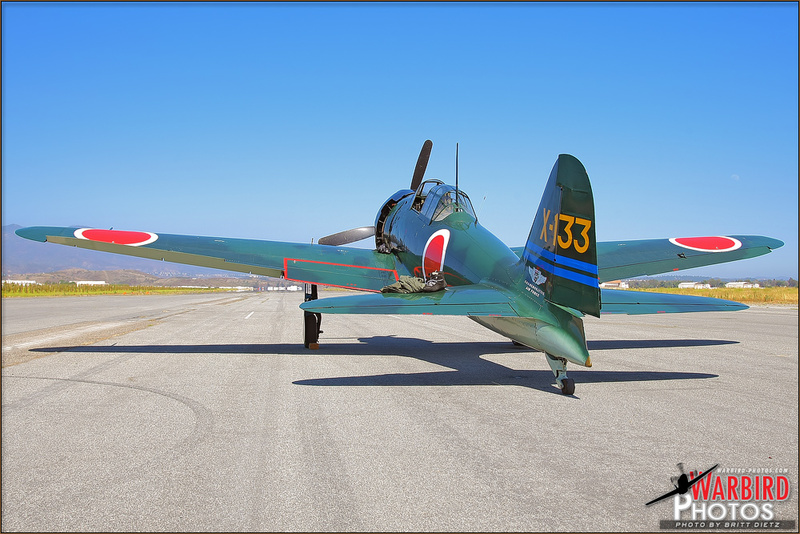 [CONTINUED] With 2011, another Great Park anniversary show and MCAS El Toro Airshow rounded the corner and even earlier in the year those in the Southern California aviation world talked about the event with excitement. It's the little Airshow that could, and this year's show seemed to be gearing up into an event that could rightfully take its place in the world of Airshows. Once July hit, it was the talk among the aviation photographers with the question "Are you going to the El Toro Airshow this year?" as word continued to spread with excitement. A few weeks prior to the show, which would be held on July 9, 2011, the schedule was released on the Great Park's website, which indicated just how much bigger the Airshow part of the event had grown. Topped off in the evening with what was stated to be a 'one of a kind' fireworks show that evening, the event would start later in the day at 3pm and conclude with the pyro display at about 9:30pm. With free admission and parking as the previous years, all was set for another great event that would bring out residents from all over Orange County and further beyond. The line for the airshow started at about 1pm. Mostly due to several misinformation issues stating various start times for the show, some arrived early thinking the show had started at 12pm, or 2pm. The official start time was actually set for 3pm, which is a bit unusual for most shows of this nature. Typically, Airshow gates open at most airports or military bases at about 8am or 9am in the morning. By 1:30pm, the line for cars stretched about 25 cars or so along the main road into the base off Trabucco. 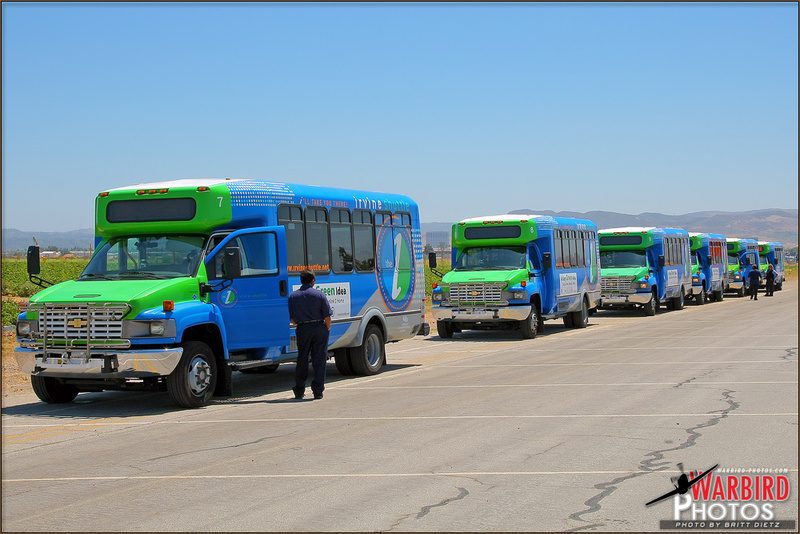 Brightly colored Irvine Shuttles await pickup of the first guests at the 2011 Great Park - MCAS El Toro Airshow. -Photo by Britt Dietz With the side roads into the base and Great Park shut down for traffic control, all vehicles would have to enter from the one entrance on Trabucco, creation a bit of confusion that was quickly fixed. At 2pm, the gates were opened and the public was allowed into the former base and down a series of roads to the now greatly expanded parking area large enough to fit a normal airshow sized crowd. To further help the anticipated crowds that would descend on the base, public transportation shuttles were brought in to take the crowds from the parking lot to the entrance of the event. That alone was a sign of the growing size of the event, with several stations for tram pickups. While entering the base, you can't help but feel the nostalgia of the old Marine base, even while most of the buildings have been removed and only a select few remain in that area. 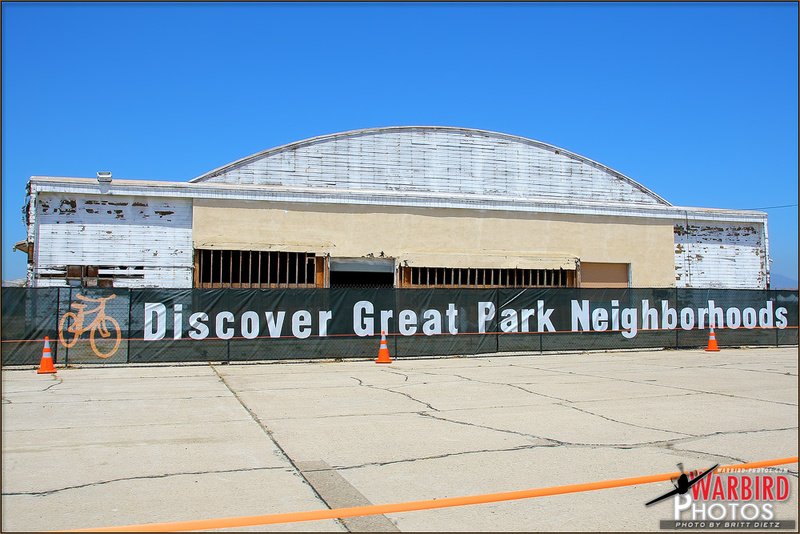 As you round the corner and into the parking area, an original hangar stands still in bad repair, but still holding together reminding you that this was indeed an active military facility. After the well planned parking job by the volunteers and a short walk to the first tram stop, a few of us early birds noticed that the trams were not yet running. With a not too far walk to the entrance, quite a few decided to just walk instead of waiting for the trams to start taking guests. Walking to the entrance, you could observe the aircraft on display including what appeared to be several modern military aircraft, a new addition for the airshow. Rotor blades rose out of the rows of tents, and several other vintage military aircraft lined the areas in between. Once in the main event area, a short walk over to the section called "The Runway" was all that was needed to get you to the aircraft. 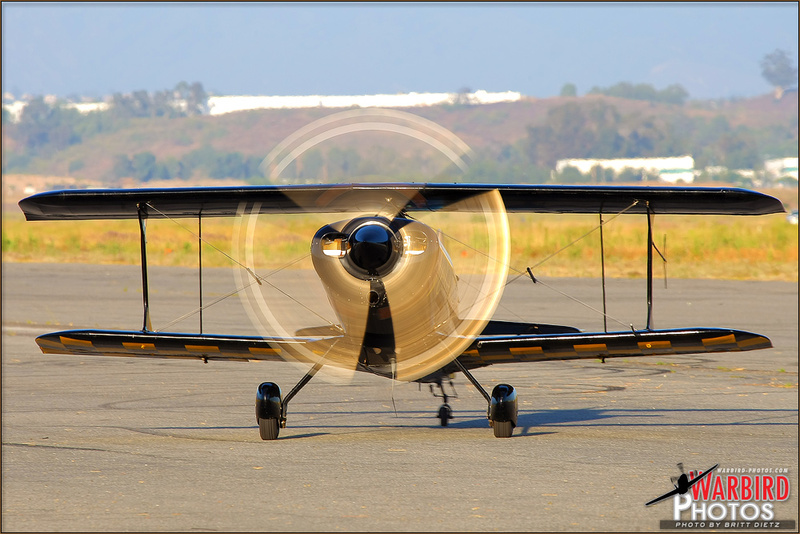 Right as you entered the 'Runway', you're immediately greeted with the sight of several vintage military aircraft including a 1930s N3N-3 Canary and a 1940s SNJ-5 Texan trainer. A booth vendor for the MCAS Miramar Command Museum down in San Diego (where many of the former MCAS El Toro museum exhibits were relocated to after Marines transferred to Miramar) brought various El Toro related displays, including a very popular showcase of all the MCAS El Toro Airshow posters from 1989 through the base's last airshow in 1997. 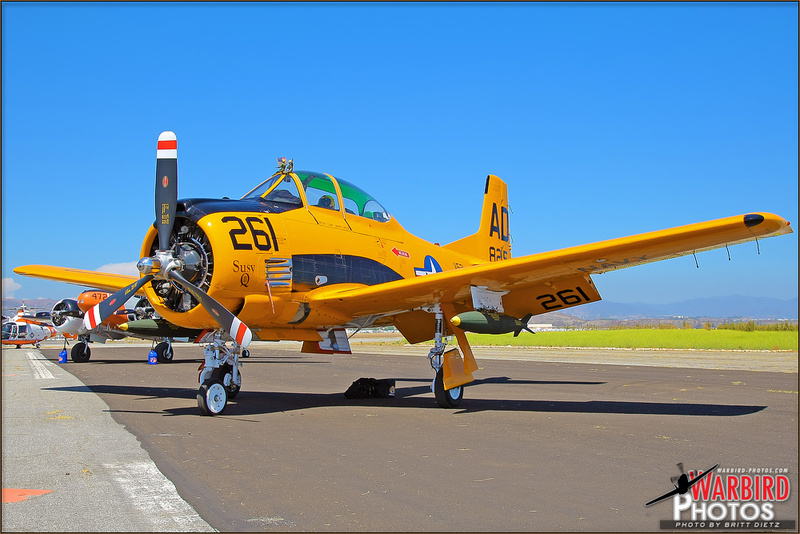 A North American T-28B Trojan sits on static display at the 2011 Great Park MCAS El Toro Airshow. -Photo by Britt Dietz Once past there, you're greeted with the first modern military aircraft, one of two US Marine Boeing CH-46E Sea Knight helicopters, this one from HMM-364 "Purple Foxes" based at Camp Pendleton, California. The crew of the CH-46 sat nearby ready to answer questions and sell various squadron memorabilia. Various vintage military vehicles followed the helicopter, with jeeps and trucks from World War 2, Korea, and more. It was an impressive grouping of historical military vehicles for the size. Following them came in a large section of helicopters including a Los Angeles Police Department Eurocopter along with various personnel from the LAPD. Beyond them sat two surprise guests, a newer Bell AH-1Z Viper and Bell UH-1Y Venom, both from HMLA-367 "Scarface" squadron based at Camp Pendleton. Pilots and crew were on hand to answer all questions and give people tours of the two very modern upgrade helicopters. The Viper is the upgraded version of the AH-1W Super Cobra and the Venom being the upgrade for the UH-1N Huey with noticeable differences in their upgrades. A roped off full size non-operational unmanned MQ-1 Predator drone sat near the Venom drawing one of the biggest crowds all day of people wanting to see the futuristic robotic aircraft. The last modern military helicopter the US Marines brought down was a special one, and a bit of a homecoming. Another Boeing CH-46E Sea Knight sat on the east corner of the Runway area, this Sea Knight from the HMM-764 "Moonlight" squadron. While currently a US Marine detachment at Edwards Air Force Base in Palmdale, California, what makes this CH-46 special to the Airshow is that in 1971 it was stationed at MCAS El Toro, and then stationed at MCAS Tustin in 1975 through the Tustin base's closure in 1999. 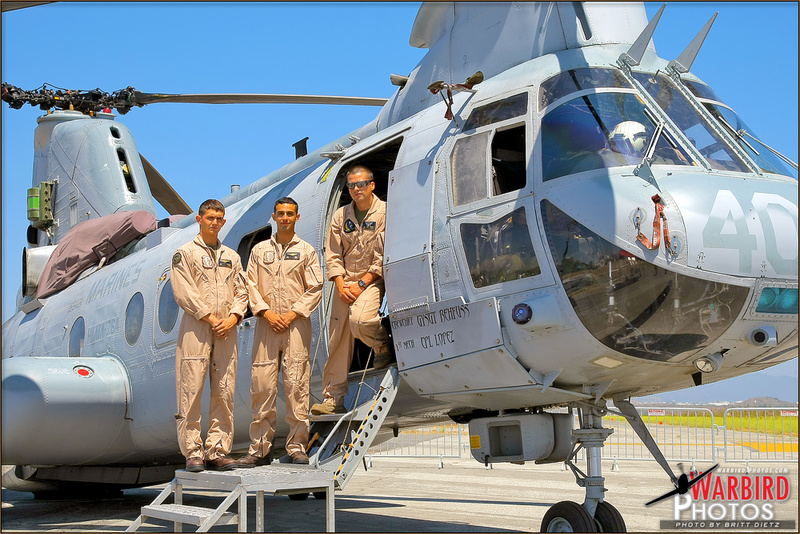 The crew of a HMM-764 'Moonlight' Squadron Boeing CH-46E Sea Knight stand next to their aircraft. -Photo by Britt Dietz While it had been 36 years since it was stationed at El Toro, there was no question that it was a nice homecoming for the helicopter and served as another historical look at the former base's occupants. The crew for the CH-46 also sat near the aircraft allowing guests to take a peak at the CH-46 and walk through the inside. The US Coast Guard sent out one of their MH-65-C Dolphin rescue helicopters painted up in retro colors of the Coast Guard as part of the Naval Centennial Celebration in 2011. Unfortunately, that Helicopter sat beyond the fence lines, so most guests couldn't walk up to it. 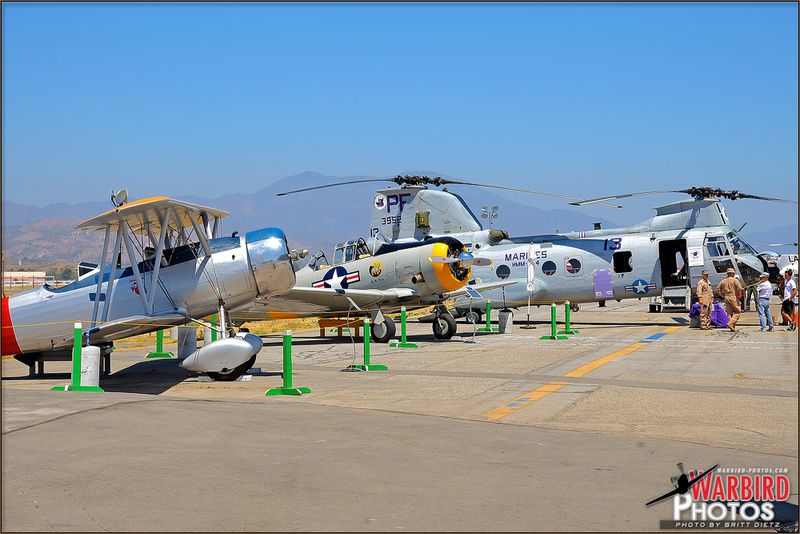 Other static aircraft on display included a C-45H Expeditor transport, T-28B Trojan trainer, Russian AN-2 Colt, Early Air Corps PT-22 Recruit, Vietnam Era O-1E Bird Dog, WW2 era L-4H Grasshopper, and assorted PT-17 Stearman biplanes. Other vintage vehicles including a 1940s era fire truck sat on display throughout the event along with various food, merchandise, and various organization booths. A large tent was put up to display to promote the currently growing Museum of Heritage and Aviation (MoHA) selling various items to raise funds for the museum which is currently using the old C-130 Hercules (VMGR-352 'Raiders') hangars to the south of the base.